1. There’s a deep dark secret behind the aquarium trade. But there’s a way to make sure that you’re not supporting this: only buy fish that’ve been tank-raised or caught without harm to the reef. Use the “Tank Watch” app to help you find reef-friendly fish. Here’s a top 10 list of popular tank-raised aquarium fish too. FISHY FACT: Clownfish are easily tank-raised, but the Pacific blue tang (Dory) can’t breed in captivity. It’s often illegally harvested from reefs, so this means buying “Dory” may be harmful to reefs. 2. It’s a serious learning adventure. Compared with a freshwater aquarium, there’s a bit more to it. The fish are more sensitive (and expensive! ), which means more devotion to making sure the water is in tip-top shape. You’ll get to put your scientist hat on and test for things like salinity, pH, nitrates/nitrites, and ammonia in the water. And then the true science happens when, based on those tests, you decide if it needs a water change, if you need to feed less, etc. You’ll also get to study up on which fish get along with others, and what to look for in an unhealthy tank. It makes for a fun brain challenge as you try and model the ocean on a miniature scale! 3. It makes a lasting impression and connects you with life. Taking care of a saltwater aquarium is filled with hands-on chances to learn and experience science, but there’s also an amazing beauty and internal reward that comes from caring for the living underwater world that’s making their home in your living room. Especially for kids who participate in the family care of this underwater world, it brings a sense of appreciation and fascination for the incredible ocean kingdom, all without needing to travel. We’ve had saltwater aquariums since we were kids, and now have them in the classroom for the students to enjoy and take part in. It’s a fun challenge (sometimes frustrating!) that’s always changing and evolving. After over 2 decades of saltwater aquarium care, you’d think we’d be experts, but there’s always something to learn! So, if you’re up for the pursuit, embrace it as a hobby you’ll devote time to care for. If you don’t think it’s for you right now, get your dose of the underwater world by visiting local aquariums, surrounding yourself with beautiful underwater photography, and recording all of the undersea shows you could binge on TV. If your kids are begging for a tank, be sure to make it a family endeavor that everyone knows is going to take care, time, and work from each person…and one that doesn’t harm reefs in the process either. And if your gut tells you “not now,” celebrate the underwater world with your kiddos with a craft like this one instead. 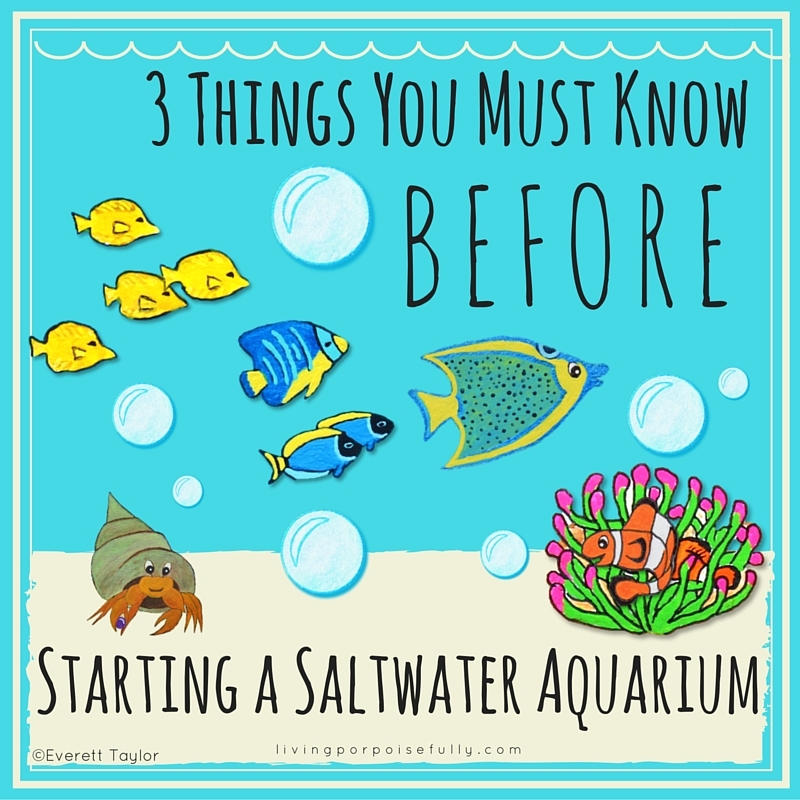 And, if you have friends or family who are thinking about starting a saltwater tank, forward this on to them so that they can be much better off going into their endeavor!